Between July 10 and 12, 1951, crowds of two to five thousand white Cicero residents repeatedly attacked an apartment building that housed a single black family. Historian Arnold Hirsch described the scene: "The burning and looting of the building's contents lasted several nights until order was finally restored by the presence of some 450 National Guardsmen and 200 Cicero and Cook County Sheriff's police" (Hirsch, p. 53). 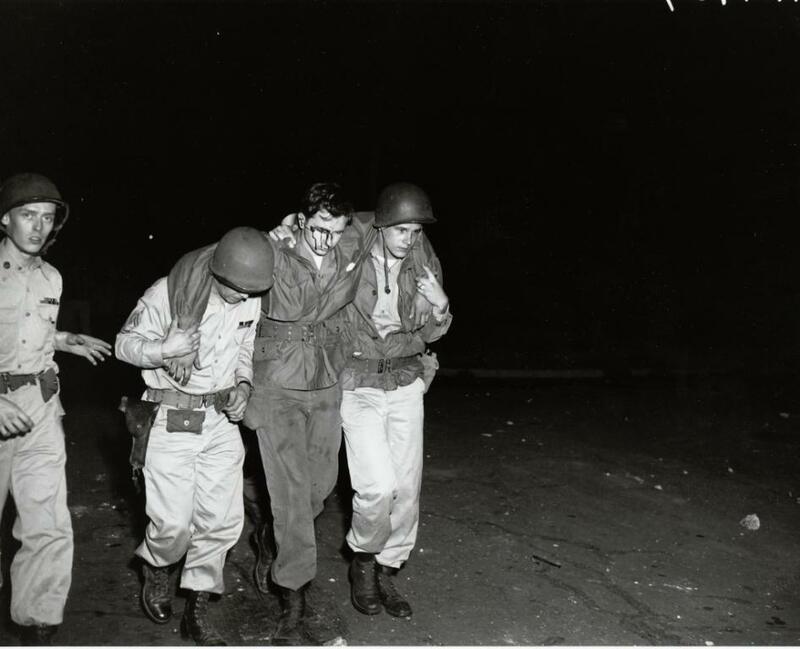 The accompanying photograph shows one of these National Guardsmen being helped away from the scene of the riots, blood running down his face. (Chicago History Museum, DN-N-7954) Hirsch explains that the Cicero riot was especially important because, unlike previous violent attempts to drive black residents out of otherwise all white neighborhoods, the press widely covered the Cicero events. Whereas the press virtually ignored violent upheaval at the Airport Homes Project in 1946, the Fernwood Park Project in 1947, in Park Manor in 1949, and in Englewood in 1949, the Cicero riots became news across the United States and the world. Word of the violence reached such far flung outlets as the Singapore Straits Times and the Pakistan Observer (Hirsch, p. 53). Perhaps most importantly, the Cicero riots began a new phase in Chicago's violent confrontations over race; rather than focusing on housing sites specifically, "battles over the use of schools, playgrounds, parks, and beaches became the dominant mode of interracial conflict" (Hirsch, p. 63). See: Arnold Hirsch, Making the Second Ghetto: Race and Housing in Chicago 1940-1960 (Chicago: The University of Chicago Press, 1983, repr. 1998).